Objects found on the beach in front of my mother-in-law's house in LaConner on Thanksgiving day. 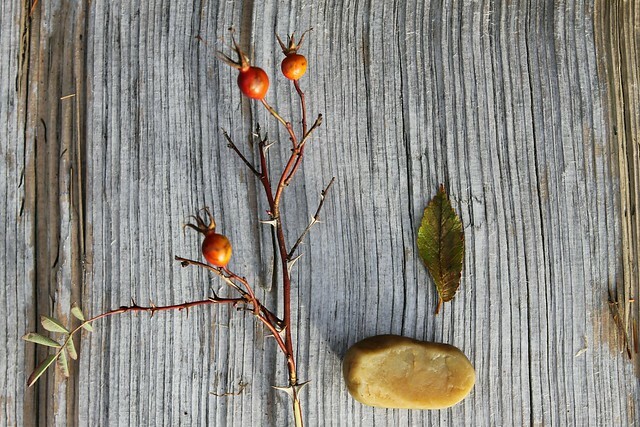 Rosehips, an ochre rock, a leaf, and a big striated block of driftwood. Loretta also found what we think is a squirrel skeleton, smooth and bleached. Crushed. Why do men now wreck his rod? So beautiful. I have loved this poem since high school. I hope that, even in this cold week, you're being brushed by those bright wings.